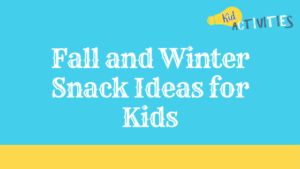 These are FALL and WINTER snack ideas which are also great ALL YEAR ROUND! After-school snacks can be a nutritious way to make sure children get the energy and nutrients they need to properly fuel their bodies and to ensure proper growth and development. Snacking can be part of a healthy diet –if snacks are chosen correctly. There are plenty of healthy ideas below as well as some treats and novel fun! Tortilla Rollups: Roll a tortilla with shredded cheese, microwave until cheese is soft, and dip in salsa. Banana Pops: Peel a banana, dip it first in yogurt and then in crushed breakfast cereal or granola; freeze. Fruit Shake-Up: Put ½ cup low-fat yogurt and 1/2 cup cold fruit juice in an unbreakable, covered container. Shake it up and pour it in a cup. Stuffed Celery: See a ton of great ‘Stuffed Ideas” in the Warm weather snack category. Put your variety of ingredients out in bowls. After kids wash their hands–give them each a baggie. (To keep track of whose is whose it is–have youth write their name on it) The ingredient will then go into each child’s baggie with their choice of mixes. Let kids know how much measurement-wise they can take of offered foods; also how many choices they can have. Example: ½ cup of 4 foods. If you like snack mixes–there are all kinds in the “Easy Snack Mix” Category! Take 1 graham cracker and 1 tbsp. chocolate frosting. Break each cracker into four sections and spread frosting on two. Place the other two crackers on top to make sandwiches. EASY ALMOST S’MORES #2 Use Marshmallow Fluff! TAKE chocolate-covered grahams and spread them with Marshmallow Fluff for easy, no-bake S’Mores! Spread peanutbutter with knife on 1 graham cracker square. Top the peanut butter with the chocolate bar. Spread the marshmallow creme on the remaining graham cracker square; place it marshamallow side down on the chocolate bar. Please check out the S’MORES PAGE for more S’more ideas! 27. HAVE KIDS MAKE THEIR OWN ‘PUDDING IN A BAG’! ***Idea: MAKE SHAKER PUDDING– Pour 2 cups of milk into a jar/container with a lid, add 1 small box of instant pudding mix, and shake for one minute. Cut a variety of cheese into small squares. For a hammer, poke a pretzel into each one. Children can connect their cubed cheese with the pretzel sticks to construct cheese towers. Let children make their own snack. 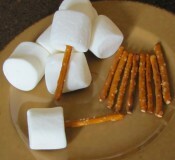 Set out some marshmallows (large or mini-your choice) and some thin pretzel sticks. MICROWAVE bacon as directed on pkg. for less crispy slices. WEAVE 1 bacon slice alternately around 1 piece of cheese and 2 pieces of fruit on each toothpick. Have a breakfast feast (or snack) with kids in the PM! You can have breakfast any time. Cereal, eggs & bacon, waffles, French toast, or pancakes. Add juice & fruits. Satisfy your salty, crunchy and savory cravings in one punch with this quick snack. Lightly spread a tortilla with a little cream cheese and place one or two slices of thin ham or turkey over the cream cheese. Roll tightly and cut into small rounds. Ingredients: Bread, cheese, lunch meat, grape tomatoes, lettuce, pickles, olives. Ingredients can be served in bowls and children choose what they like and then slide onto their skewer. 1. Cut up cubes of bread, cheese, and lunch meat (1/2-inch-thick cubes of ham and turkey are good). 2. Slide the cubes onto a skewer (long pick) with other foods the children like, such as a grape tomato, a piece of lettuce, a pickle, or an olive. 3. Set out a side of mayo or mustard for dipping. Make hoagie sandwich, using desired ingredients. On one end of the sandwich, use toothpicks or broken spaghetti pieces to position olives for eyeballs and cherry tomato for nose. Arrange shredded carrots, lettuce, or sprouts on top for hair. If desired, stick a small piece of lunch meat out of the “mouth” for a tongue. Source: Nutritionforkids NOTE: Be sure to remove all toothpicks before eating! Spread the peanut butter on the slice of bread. Next, put 2 banana circles on the bread to look like eyes. Then use a raisin as a nose. Last, make your mouth out of M&M’s candy. Spread peanut butter onto a rice cake. 1. Spread peanut butter on 2 bread slices. 2. Arrange banana slices over peanut butter. 3. Top with remaining bread. 4. Place sandwiches on cutting board and cut into quarters. Lay tortilla on a plate. Spread peanut butter evenly on the tortilla. Sprinkle cereal over peanut butter. Peel and place banana on the tortilla and roll the tortilla. 1. In a medium bowl, stir cream cheese with a spoon until soft. Stir in maple syrup. Add peanuts. Mix well to combine. 2. For each sandwich, spread about 1.5 tablespoons filling mixture on bread. Place one stick of Colby-jack cheese (or use mozzarella string cheese) near the edge of the flour tortilla. Roll the tortilla around the cheese; secure it with a toothpick (remove it later before children snack). Microwave until cheese is soft. Wraps are a fun, portable way to roll up food combinations into tasty snacks or meals. Kids enjoy getting in on the action and are amazingly creative at coming up with their own concoctions. 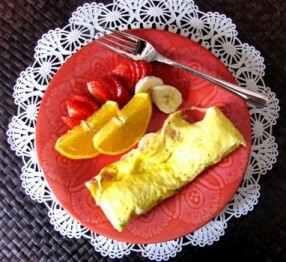 Start with a wrap such as a plain or flavored tortilla (try spinach), thin pita, or even a crepe or pancake. Try some of the following combinations or create your own! 2. Tie ends together so that they slip easily around a child’s head. This one is also nice September through November! MAKE SOME SUPER EASY AND YUMMY ACORNS! 1. Put popcorn in a heavy paper bag. 2. Melt butter in a saucepan and mix together sugar, syrup, and salt. 3. Add 1/2 teaspoon baking soda and stir well. 4. Pour into paper bag and stir with a wooden spoon. Put bag in microwave and cook on high for 1 1/2 minutes. Take out and shake well. 5. Cook for another 1 1/2 minutes. Shake bag again and pour into a large container. 6. Serve in paper baggies that kids can decorate. 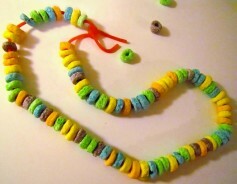 This recipe is very inexpensive and easy to make. Put one stick of butter or margarine in a medium saucepan; add one cup packed brown sugar (light OR dark it doesn’t matter). Add 3 TBS. Karo Syrup. Remove from heat and quickly add 1/2 tsp vanilla and 1/2 tsp baking soda. Stir and quickly pour over a large mixing bowl full of popped corn. Mix it all up to get it evenly coated. Enjoy! For a good sized group take 3 bags of popcorn, plus 1 bag of goldfish, 2 cups of pretzels, plus 1/2 cup each of raisins and dried cranberries. However, you can make it in whatever proportion you like. For a special treat, you can even add some M&Ms. Note: the “Mallow Magic” comes with packets of gooey icing to put over the top; it’s not necessary. And of course it adds extra calories and sugar. Over medium-high heat, melt butter in a non-stick saucepan. Add entire bag of marshmallows to the pot. Stir constantly until all of the marshmallows have melted. Remove from heat. Pour entire box of cereal into a large non-stick pot or bowl. Pour marshmallow mixture over the cereal. Stir to completely cover all of the cereal. Using small fun shaped cookie cutters cut shapes out of a flour tortilla. Place on non stick cookie sheet and lightly brush with a little butter. Lightly sprinkle (you only need a little) with a mixture of 1 part cinnamon and 3 parts brown sugar. Bake in a moderately hot oven for 10 minutes for a sweet and crispy treat. NOTE: These are light and crispy and were really a hit!!! The treats can be made any time of the year, with any shape. 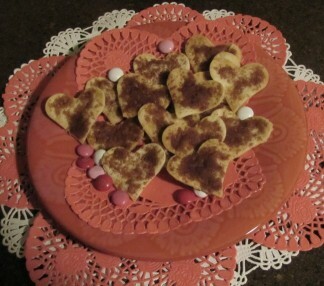 Except for the ‘heart shape’, KidActivitie’s cookie cutters were not sharp enough to easily cut through the tortillas. KA will definately be making these again! 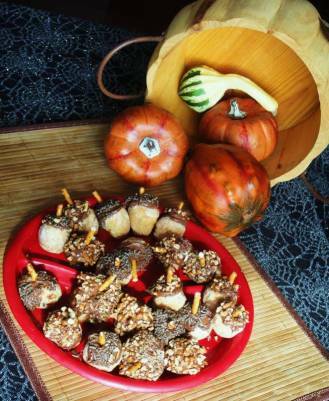 Visit the ‘PUMPKIN Snacks & Recipes ‘ page for other great pumpkin food ideas! 55. PUMPKIN SPICE HOT COCOA – Wonderful for Autumn evenings! You can quickly make pumpkin seeds in your microwave. The shells are edible — and a good source of fiber. You can also use this method with other seeds such as acorn squash and butternut squash also. to 2 cups of water. Dry an additional day, and follow the above directions. 1. In saucepan, stir Velveeta and salsa over low heat until Velveeta is melted. Stir in cilantro. 2. Serve hot with tortilla chips and veggie dippers. Microwave Velveeta and salsa in 1 1/2 quart microwave safe bowl on HIGH 5 minutes or until Velveeta is melted. Stir after 3 minutes. Stir in cilantro. Serve as directed. …Made on Stove or microwave and good anytime! MIX VELVEETA and chili in microwaveable bowl. Microwave on HIGH 5 min. or until VELVEETA is completely melted and mixture is well blended, stirring after 3 min. SERVE hot with tortilla chips, RITZ Toasted Chips or assorted cut-up vegetables. 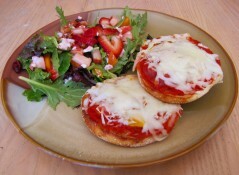 2 to 3 tablespoons grated mozzarella cheese (Can also add Parmisian 1. Spread 1 to 2 teaspoons of sauce on each bagel half. Sprinkle with grated cheese. 2. Microwave, bake or broil until cheese is melted. Start with Baby Greens–sliced strawberries and blue cheese crumbles are a must. Add…your choice of cut up apples, walnuts or pecans, (I like the sugared nuts–but plain is fine) cucumbers, yellow or red pepper slices (like the green but sweeter and more colorful). I also add dried cherries or cranberries. The dressing used is Rasberry–Gerard’s is the best with this! Sprinkle cheese onto muffin half. Heat in toaster oven or at 350 in oven until cheese melts. 1. Toast the bread until slightly brown. 2. Top bread with pizza sauce, vegetables and low-fat cheese. 3. Sprinkle with Italian seasonings as desired. 4. Return bread to toaster oven (or regular oven preheated to 350 degrees). 5. Heat until cheese melts. This low-carb pizza is a great, quick treat. It comes from a diabetic website and is broken down for diabetic information needs. HEAT Little Smokies or weenies as directed on package. MIX jelly, chili sauce and cornstarch in small saucepan. Cook on medium heat 5 minutes or until sauce boils and thickens, stirring frequently. POUR sauce into slow cooker or fondue pot set on LOW heat. Add little smokies. There are 7 Hot Dog and Little Smokie Recipes in the No-Baking Category. All are made in Crock-Pot! 64. FRIENDSHIP SOUP! Hot-hearty and healthy for cold days!!! Great for after school programs or cooking club…Think about making a big pot of soup in a crock pot. You can start it in the morning program and let it go on low during the day. Have kids sign up to bring potatoes, small onion, carrots, celery, cans of beef broth, can of diced tomatoes, seasoning, crackers or rolls, etc. * Each child would only have to bring a single item to make a huge pot. * If your program isn’t too large—canned soup heated is also good! Clean out the pumpkin and don’t cut a face. Easiest directions you’ll ever get! I boil some chicken off the bone or purchase the chicken in a can at Sam’s Club. Chop some potatoes; throw in a can of green beans, corn, and tomato sauce. I also add some chicken broth. Simmer until done. (This is faster with the canned chicken) Serve in small cups with some saltine crackers. (I made this for my 2, 3, 4 year old classes-Older mixed groups will also like it!). 1. Spread 1 to 2 teaspoons of sauce on each bagel half. Sprinkle with grated cheese. 1. HEAT Little Smokies or weenies as directed on package. 2. MIX jelly, chili sauce and cornstarch in small saucepan. Cook on medium heat 5 minutes or until sauce boils and thickens, stirring frequently. 3. POUR sauce into slow cooker or fondue pot set on LOW heat. Add little smokies. FRIENDSHIP SOUP! Hot-hearty and healthy for cold days!!! This one is fun for a autumn or winter breakfast party, cooking club or wilderness/camping theme! Place two or three scoops of cottage cheese on a salad plate. Place the raisins to create buttons and eyes. Cut a small piece of carrot for the nose and a slice of celery for the mouth. and the hat is cut from the toast. 1. Place vanilla wafers on plate so they are in a vertical line. 2. Coat each wafer with vanilla icing. 3. Decorate snowman however you like. Some ideas: Round sprinkles for eyes and mouth, raisins for buttons, candy corn for the nose. Warm the tortillas slightly in the microwave so you can fold them. Next fold the tortilla into half, then half again. Cut out designs just like you were making a paper snowflake. Put a small amount of oil into a skillet. Fry the tortilla in hot oil until crisp. (About 30 seconds on each side) Absorb extra oil on paper towel. Sprinkle with powdered sugar. 1. Depending on the size of the flour tortilla..(this one is large and the above were smaller) Fold it in half–and then in half again. 2. Cut out a ‘Snowflake shape’–just as you would using paper. 3. Place on non stick cookie sheet and lightly brush with melted butter. 4. Bake in a moderately hot oven for 10 minutes for a sweet and crispy treat. ( (If the snowflake is large and a little thicker–it may need an extra minute. Take out of over when starting to crisp and look golden. NOTE: These can also be made using a snowflake cookie cutter! Have children pick their favorite drink (fruit punch, apple juice, etc) and then pour it into an ice cube tray. Have kids write their name on a Popsicle stick and put it in the tray. When frozen—you have an igloo block for snack. Cover candy layer with Cool Whip and decorate it with gummy bears. Serve it in small-clear plastic cups for individual serving or one big vat that everyone shares. Usually, children like to have their own. 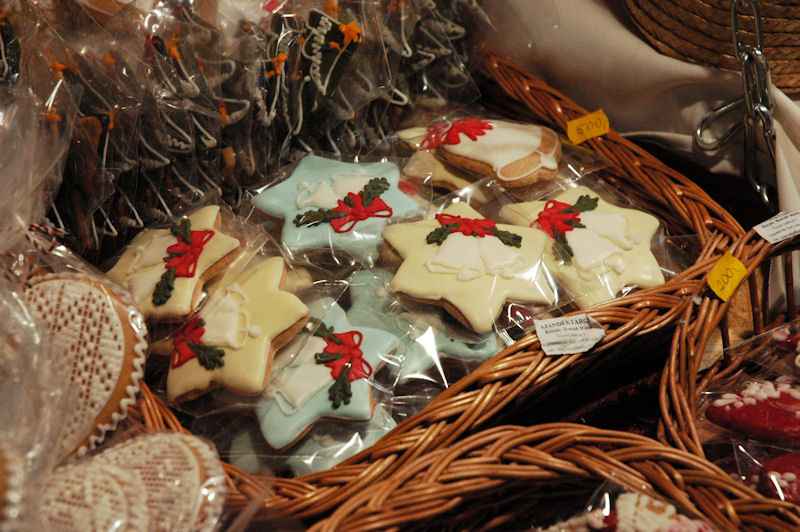 Small graham cracker figures such as teddy bears or elves. This sample used ‘Gummy Penguins’! 1. Pat dry the peach half-and put on paper place. 2. Cover the peach with the topping to resemble an igloo. 3. Sprinkle on the coconut. 1. Give each child a plate and piece of fruit. Spread the fruit entirely with the frosting or fluff. cover the “igloo” with the mini-marshmallows. 3. If desired, add a chimney with a pretzel rod piece.Enjoy a while and then eat! Melt margarine in a saucepan and stir in the marshmallows until smooth. After the mixture has cooled slightly, rub your hands with margarine or butter. Using your hands, form balls with the mixture. Shake the balls in a zip-lock bag to coat with the confectioner’s sugar. Makes approximately 24 two-inch “snowballs”. Kids will have fun making these NO-BAKE nutty snowballs. 1. In a large bowl, combine peanut butter and butter until blended; add confectioners’ sugar, 1/2 cup at a time, stirring after each addition. 2. Line a baking sheet with foil. Using your hands, shape peanut butter mixture into 1-inch balls. Place balls on prepared baking sheet; chill until firm, about 1 hour. 3. Place white chocolate and shortening in a large microwave-safe bowl. Microwave on MEDIUM, stirring at 30-second intervals, until chocolate is melted and smooth (about 2 minutes). 4. Line a baking sheet with waxed paper. Using a spoon, dip each peanut butter ball into melted chocolate, spooning chocolate over ball to coat, if necessary. Combine sugar and cocoa in mixing bowl and stir with spoon. Add condensed milk and vanilla; blend until smooth. Stir in walnuts. Cover bowl tightly and chill in refrigerator for 30 minutes. After the 30 minutes, shape mixture into 1″ balls. Next, roll them in confectioners’ sugar. Place balls in an airtight container and chill in refrigerator for at least 2 hours before serving. Have children collect clean snow in a large bowl. Add approximately one cup of milk, 1/2 cup of sugar and some vanilla extract. It will be about the same texture as a milkshake! This is really easy and the kids can do it themselves. Kids always love this one! How easy can this be? Kinda cute-kinda silly…but the kids will love him! Spread peanut butter on the crackers. 1. Cut bread in half from corner to corner, making two equal triangles. 2. Spread peanut butter over bread. 2. Remove from heat and add cereal, stirring gently to coat well. 3. Add the powdered sugar, a bit at a time, and continue stirring until mixture is completely combined. Spread pieces on a cookie sheet or other clean, flat surface, separating them so they don’t stick together. Place a small amount of peanut butter on the top of a Nutter Butter cookie. Put a small pretzel twist on the peanut butter, letting it stick beyond the cookie for antlers. Put two more dots of peanut butter and add raisins for eyes. 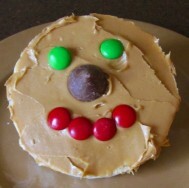 Finally put a dot of peanut butter on the bottom part of the cookie and add a red M & M for a nose. Two balls of Ice-cream to build a snowman. For the eyes, nose and mouth–choose from small pieces of banana, cherry, raisins, m&m’s or ______ and place where indicated. You’ll end up with a friendly, yummy snowman. This child-made snowman has a strawberry for his hat! IF THE SNOW ON THE GROUND BOTHERS YOU —scoop up some clean snow and place it in a bowl or dish—you can also take the snow inside and make your candy there! NOTES: KIdActivities made two versions of the snow candy recipe. The first used an ‘off the shelf imitation’ maple syrup. The second used a ‘pure maple syrup’. Although the imitation maple flavored syrup set up quickly–it began to melt immediately. The true maple syrup had much better results. Snack mix with chocolate, peanuts, marshmallows and pretzels. Make it in minutes. Make Jello using only 1/2 of the recipe directed amount of water. Fill an ice cube tray with the Jello and refrigerate. Carefully pop out each “cube” with a knife. Ingredients: 1 Angel food or chiffon cake (purchased or homemade), 1 carton (14 oz.) thawed frozen whipped topping, 2 2/3 cups flaked coconut. 1. Place cake in center of serving plate. 2. Frost cake with whipped toppoing using a spatula. Sprinkle the frosted cake with coconut. Refrigerate until serving time. Store leftovers in refrigerator. Combine cream cheese, butter and vanilla In a mixing bowl. Cream together. Add in powdered sugar. Blend. Lay out a sheet of plastic wrap and scatter powdered sugar over the top. Place dessert ball on top of sugar and roll ir around to coat entire ball. Wrap up in plastic wrap and chill several hours. Serve with graham crackers, plain vanilla cookies or shortbread cookies. Scrape the light brown crust off the cake. Tear the angel food cake into pieces and line the bottom of the pan. Place whipped topping on top of the cake pieces. Use a spoon to place cherry pie filling on top of the whipped topping. Chill for a few hours. *Another version made with Chrystal Light is in ‘Apple Snacking and Cooking Category. 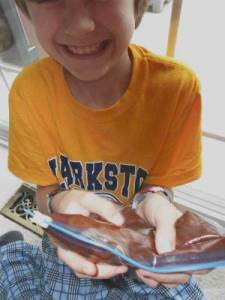 1) Put the Kool-aid and ginger ale in the refrigerator until they are cold. 2) Fill a glass almost halfway with blue Kool-aid. 3) Add ginger ale almost to the top of the glass. 4) Drop in one big scoop of vanilla ice cream. There you have it, 67 fall and winter snack ideas for kids.